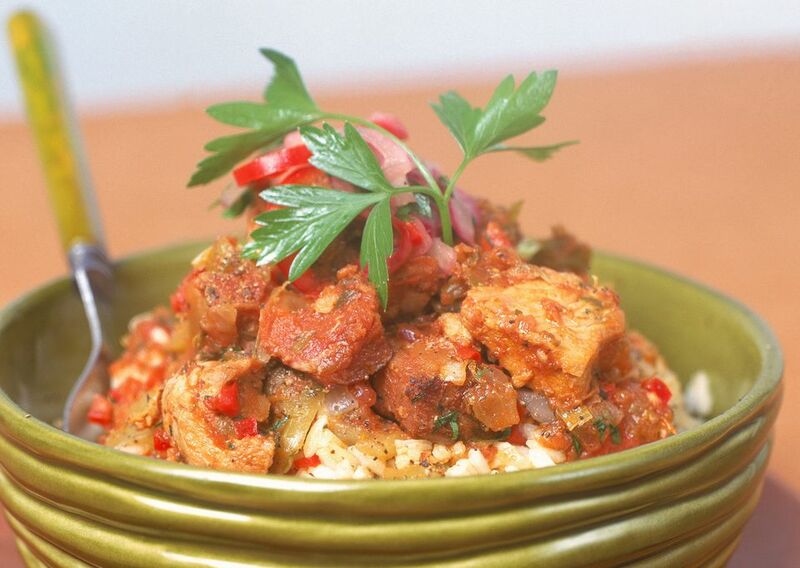 Jambalaya, a Cajun/Creole dish, is perhaps the most versatile main dish the South has to offer. The origin of the name is uncertain, but as with many dish names, there are a few good guesses along with a bit of folklore. Most believe the name came from the Spanish word for ham, jamón, a prime ingredient in the first jambalayas of the eighteenth century. John Mariani in "The Dictionary of American Food and Drink" offers a more colorful origin of the name: A gentleman stopped by a New Orleans inn late one night to find nothing left for him to dine upon. The owner thereupon told the cook, whose name was Jean, to "mix some things together" — balayez, in the dialect of Louisiana -- so the grateful guest pronounced the dish of odds-and-ends wonderful and named it "Jean Balayez." The first reference to the word in print was in 1872, and "The Picayune's Creole Cook Book" (1900) calls it a "Spanish-Creole dish. Rice, essential to Jambalaya, has been an important crop in the South for several hundred years. Rice production in the South began in North Carolina in the late 1600s, with great success. By the late 1800s, after a series of problems from labor to weather, the Southern Atlantic states production foundered. Louisiana began producing rice in late 1889, and is today one of the major producing states, along with Arkansas, California, and Texas. "In Louisiana, rice achieved its American culinary apotheosis. In a great variety of jambalayas, it became the central element around which a number of complex combinations were arranged. Rice was no longer a bland foil for setting off exotic flavors but the featured item absorbing, reacting with, and defining other ingredients." There are countless variations on this dish. According to food historian and writer John Egerton, in Gonzales, Louisiana, the self-proclaimed Jambalaya Capital of the World, you can find about as many recipes for this dish as there are households. (Gonzales holds an annual Jambalaya cook-off contest.) Jambalaya may be made with beef, pork, chicken, duck, shrimp, oysters, crayfish, sausage, or any combination. Some of the more standard additions are green pepper, cayenne pepper, tomatoes, celery, and onions. Generally, the vegetables are sautéed and meat(s) cooked, then broth or water, tomatoes, seasonings, and uncooked rice are added. The mixture is simmered until the rice is done, and shrimp (or any other foods which should not be overcooked) are added near the end of the cooking time.